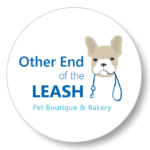 Other End of the Leash serves Durham area pet owners seeking a distinctive, locally owned source for USA and fairly traded nutritional supplements, food, toys, leashes, and collars, as well as pet-themed jewelry and merchandise for your home. We bake treats daily in our on-site gluten-free kitchen as well as host in-store informational workshops, speakers and special events on a regular basis. We look forward to meeting you and your pet soon!